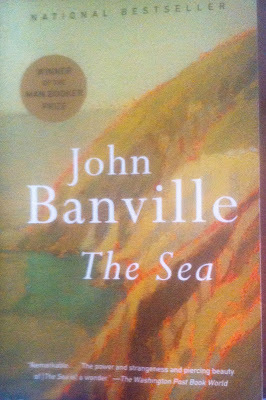 GOTAS DEL TINTERO: John Banville. The Sea .... una novela simplemente, ¡perfecta! John Banville. The Sea .... una novela simplemente, ¡perfecta! "They departed, the gods, on the day of the strange tide. All morning under a milky sky the waters in the bay had swelled, rising to unheard-of heights, the small waves creeping over parched sand that for years had known no wetting save for the rain and lapping the very bases of the dunes. The rusted hulk of the freighter that had run aground at the far end of the bay longer ago than any of us could remember must have thought it was being granted a relaunch. I would not swim again, after that day. The seabirds mewled and swooped, unnerved, it seemed, by the spectacle of that vast bowl of water bulging like a blister, lead-blue and malignantly agleam. They looked unnaturally white, that day, those birds. The waves were depositing a fringe of soiled yellow foam along the waterline. No sail marred the high horizon. I would not swim, no, not ever again. Someone has just walked over my grave. Someone." Banville, John (2005),The Sea, New York: Vintage Books, Random House Inc.